The Earliest Christian Meeting Places : Almost Exclusively Houses? 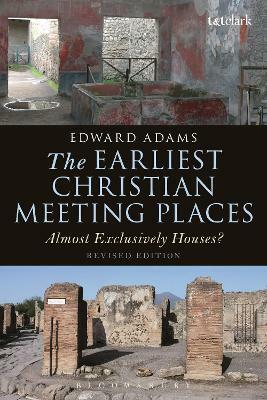 Edward Adams challenges a strong consensus in New Testament and Early Christian studies: that the early Christians met `almost exclusively' in houses. This assumption has been foundational for research on the social formation of the early churches, the origins and early development of church architecture, and early Christian worship. Recent years have witnessed increased scholarly interest in the early `house church'. Adams re-examines the New Testament and other literary data, as well as archaeological and comparative evidence, showing that explicit evidence for assembling in houses is not nearly as extensive as is usually thought. He also shows that there is literary and archaeological evidence for meeting in non-house settings. Adams makes the case that during the first two centuries, the alleged period of the `house church', it is plausible to imagine the early Christians gathering in a range of venues rather than almost entirely in private houses. His thesis has wide-ranging implications. Edward Adams is Lecturer in New Testament Studies at King's College London, UK. He is also the author of 'Constructing the World: A Study in Paul's Cosmological Language' (2000, T&T Clark) and has co-authored 'Christianity at Corinth: The Quest for the Pauline Church'.